Gulf War Syndrome: Is It a Real Disease? asks a recent headline in the New York Times. This question--are certain diseases real?--lies at the heart of a simmering controversy in the United States, a debate that has raged, in different contexts, for centuries. In the early nineteenth century, the air of European cities, polluted by open sewers and industrial waste, was generally thought to be the source of infection and disease. Thus the term miasma--literally deathlike air--came into popular use, only to be later dismissed as medically unsound by Louis Pasteur. While controversy has long swirled in the United States around such illnesses as chronic fatigue syndrome and Epstein-Barr virus, no disorder has been more aggressively contested than environmental illness, a disease whose symptoms are distinguished by an extreme, debilitating reaction to a seemingly ordinary environment. The environmentally ill range from those who have adverse reactions to strong perfumes or colognes to others who are so sensitive to chemicals of any kind that they must retreat entirely from the modern world. 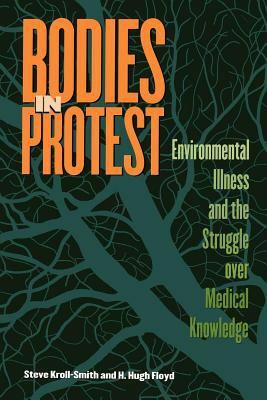 Bodies in Protestdoes not seek to answer the question of whether or not chemical sensitivity is physiological or psychological, rather, it reveals how ordinary people borrow the expert language of medicine to construct lay accounts of their misery. The environmentally ill are not only explaining their bodies to themselves, however, they are also influencing public policies and laws to accommodate the existence of these mysterious illnesses. They have created literally a new body that professional medicine refuses to acknowledge and one that is becoming a popular model for rethinking conventional boundaries between the safe and the dangerous. Having interviewed dozens of the environmentally ill, the authors here recount how these people come to acknowledge and define their disease, and themselves, in a suddenly unlivable world that often stigmatizes them as psychologically unstable. Bodies in Protestis the dramatic story of human bodies that no longer behave in a manner modern medicine can predict and control.Kroll-Smith, Steve is the author of 'Bodies in Protest Enviromental Illness and the Struggle over Medical Knowledge' with ISBN 9780814747520 and ISBN 0814747523. Loading marketplace prices 120 copies from $2.93 How does the rental process work?